Burda cap-sleeve top and a bit of a whinge-up! Once in a while a sewing project is sent to try us. This particular little smart-arse of a sewing project first lured me from the glossy pages of Burda Style around this time 3 years ago. It presented a cool, stylish-looking basic that could rock any skirt, shorts or pair of strides. Edgy with its contrasting shiny sleeve caps, close-fitting for sleekness of style and a raised neckline for a fierce, designer don’t mess with me touch. I should have got that message first time round really! My self-imposed rule not to impart cash for cheaply made RTW clothes has been obeyed for a good few years now. And I’d say it’s largely been very easy and fun and rewarding. But to summon up the motivation to make what is fundamentally a basic black staple is much harder than making a pretty dress. That’s way more fun. I cannot even begin to recount the hours spent on this tiny little top. It was definitely a test of patience. Largely because I didn’t do a muslin so no surprises really. I decided to stick to the suggested fabric which was crepe satin – luckily there was little needed because this fabric didn’t come cheap either. Read on if you can really bear to listen to my gripes! First gripe: crepe satin. I will think twice before sewing those stupid shiny sides together in a hurry. They move! But having said that, lucky the shiny sides were inside because they also catch on just about anything that is vaguely rough. Like hands, unfiled nails, pins etc etc. It also frays. And so every seam, every edge had to be overlocked. Do not even attempt this top, in this fabric if you don’t have sufficient means to finish every single edge. And OMG, static alert! I tried this top on at least 10 times to check fit and shape of sleeve etc and the electricity ran at least 240v from root to tip of hair. This firmly remains one of it’s unforgiving factors! The bust darts are way too low for me. I know, I know, I didn’t toile! There are two zips involved in this top, or else you’d never get it on. One from the neck edge down the top of the left sleeve. And another under the left arm and down to the hem. Fine in principle, definitely not fine if you want two matching shaped sleeves! I bought a couple of quality invisible zippers from Dalston Mill. I remember thinking at the time that I should perhaps invest in more quality notions. I usually get them from Shepherds Bush market for a snip of the price. But it wasn’t such a good call ater all. Sadly the teeth were metal and so the zips less flexible coupled with the instructions to end the zipper a couple of inches from the hem, I ended up with one sleeve fit for a Gary Glitter tribute and another as a deflated floppy thing. Zipper aside, at that point I realised the sleeves were far too roomy in any case. They seemed to fit snugly on the model which is confusing given my substantial arm girth. So I removed said sleeve zipper and shaved a bit off each of the top sleeve seams to ‘smallen’ the sleeve cap. Removing the zipper was a mare. Black on black, mostly with a crap lightbulb overhead and from hostile fabric that was just goading me to be snagged. I put a new cheapo lightweight zipper in but made it run from top to bottom this time. Better but still not brilliant. Plus it took 2 goes to insert. Don’t ask! In hindsight I should have sewed another just to the seam allowance on the wrong side of the opposite sleeve to match the shape better. I may still do this. The sleeve hems are hand sewn. Catching 1 of those damned threads at a time so it doesn’t make a mess of the right side. And the underarm seams are finished with a self made bias strip, hand sewn to the inside also. Slowly, slowly, catchy monkey! So then there was the neck facing. Could well have been me but I’m totally blaming those Burda-style translations. I have such a problem with visualising even the simplest written instructions. Give me pictures every time. So after the umpteenth read, I gave up trying to understand and went ahead governed by my own hunches! They were rubbish hunches and I ended up sewing the bottom bit of the facing to the shoulder/top sleeve seam. What is wrong with me? I was all twisted and distorted and I was convinced the facing was the wrong shape! A right proper meltdown ensued. Foot on the pedal-bin pedal, lid raised, dangled over the sprout peelings and prosecco foils, the whole thing was about to meet its demise! Saved by a flash of possibility. I spared the wretched thing and spread it inside out on the ironing board to instantly see the issue: The lower end of the facing was meant to be sewn around the armhole… of course!! More unpicking. More hand sewing. It worked. Kind of. But even though I’d used a stretch interfacing (My own recommendation, not Burda’s) it doesn’t behave the same as the outer and there is still an element of ‘pull’. Although the sleeves are too big, the body is a touch too small. I clearly overestimated the stretch in this fabric and underestimated the difference in a petite sizing, which this pattern was. I might possibly get away with it in a dark room with a jacket on! The hours involved to create something that is at best a black top, have completely taken me by surprise. I seriously could have whipped up a whole dress in as much time! If I did it again, I’d go up a size and definitely redraft the sleeves. I’m glad I didn’t give in though and I’m glad I found a way to solve the main issues. I hate being defeated at anything. I don’t often work with fine fabrics and clearly this is something I need more practice in next year. But for now I’m rifling though some good old fashioned vintage dress patterns where suiting and furnishing fabrics are my favourite friends. Onwards and upwards! Happy New Years Eve, my wonderful readers. Wishing you all a healthy, productive and successful 2016. It’s really cute. Sewing black in winter, spesh that fabric, is never going to be a joy, and you are a trooper to see it through. I think it’s really styley, in a super expensive way that only simple things can be. I had a shell top a bit like this in the late 90s, bought fro a designer store that cost me over $300. I love sewing fine fabrics, it’s like sewing tai chi – slowing down, practising patience and precision is good for me and my slap dash ways. I sense you may have cracked onto this a little as well, even though this one has fought you! Happy New year dear one! You totally hit the nail on the head, as always, MrsC! Though I definitely didn’t slow down enough or practice enough precision. It’s a crap feeling knowing the only way is to start again but I’ve learned a whole heap of stuff in the meantime and that’s what I love most about sewing! Worth the effort. The resulting top is lovely! Well done you for struggling on with it. You’ve been on yet another learning curve, It looks good and your waist looks super tiny. I hate giving up too but I confess that a few weeks before Christmas I threw a whole dress in the bin. A dress I’ve made loads of times for myself without problems (well, only self inflicted ones) completely defeated me once I made it in a different size for my daughter. It was too big in certain areas and the problems started when I tried to alter it. The fabric ended up looking like a piece of old rag – I’d completely lost my rag – and I decided the stress just wasn’t worth it. 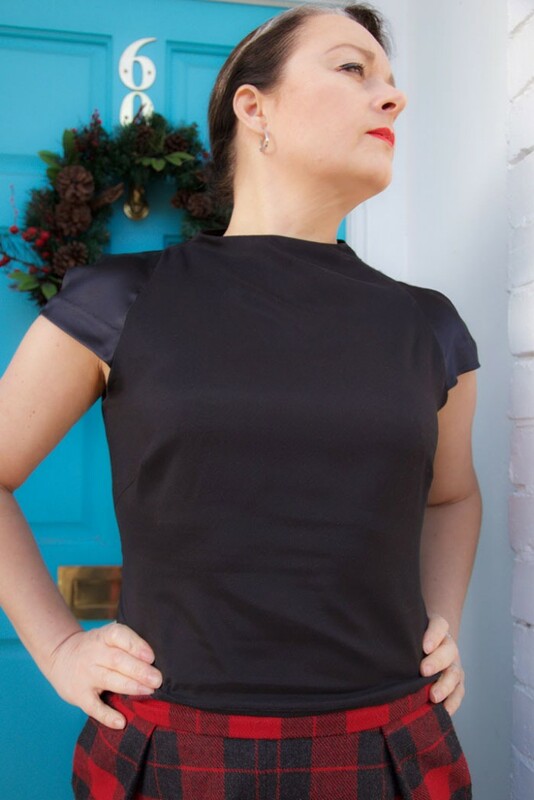 I need to ‘get back on that horse’ soon otherwise I can feel myself entering one of those periods in my life where I put dressmaking on the back burner which is a shame as I finally have an overlocker and still get all warm and fuzzy when I see those beautifully finished seams. Black top worked out Ok in the end though, well done for fighting on! Argh! What a nightmare! I congratulate you for sticking with it because it looks lovely. And your tartan skirt is gorgeous. Sounds like a hellish sew! Good for you for not giving in. I hate being beaten by a tiny bit of fabric too. Thank you. I am quite a bad loser to be honest! I have to say with all your troubles, it still looks fabulous on you! I think I would have caved and it would have been in my trash can. I don’t like to do that, but unfortunately my patience has its limitations! Bravo!! Thank you Shirley. It looks way better in the pictures. Just feels so wrong but hey… lessons learned! Well done for seeing it through, I suspect I may have thrown it on the UFO pile before reaching the end! It looks great in these photos even if it has bad memories of unpicking associated with it for you now! Thanks Charlotte. It was a close call! It’s not a great fit. Looks way better in the photos but it was a good learning curve. Good for you for not giving up. Although it was painful, think of the laughter you have given your followers, at the reading of this post! Just think, now that you have this behind you, the year can proceed anew! Good work persevering. The result looks good in the photos anyway. But yeah, sympathesise with having to put so much effort into one simple little black top. I too was tempted by this patyern though I never got aroud to investigating the details. Double zippers would have scared me off. So thanks for the warning! If I get arpund to making it I think I will make it in stretch knit. Wow, what a great and concise explanation. I have really enjoyed your aesthetic taste. You are looking pretty in this top. Thanks dear for sharing this unique thoughts with us. And I want to share my blog with you, Churidar Neck Designs. Previous PostPrevious Curtain call for the Martini!